Well, it's Tuesday, and you all know what that means! Yes, it's another Peachy Keen Challenge! 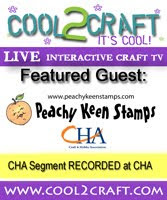 This is the card I created for the Peachy Keen Challenge #4! Another little Lulee! Isn't she the cutest?!! I want to pinch those rosy little cheeks! I can't tell you how much fun it was to watercolor this card! I so very much enjoyed it!! I had the K&Co. paper stashed away, and I knew I wanted to use it, so I took my color scheme for Lulee from the colors in the paper. With already having this great sketch, all I needed was to put it together, but when I got to the bottom of the card, I decided I needed something else. It looked so bare! Well, I had to think for a bit about what to do, and suddenly it occured to me that I needed some fishnet!! Yep! That was just what I thought it needed, so out came the trusty crochet hook and some fine cotton thread, and VOILA!! Fishnet in a flash!!! The splash sentiment was cut from the background paper, and adding the buttons over the fishnet completed the requirements for this challenge. What a great challenge it is!! Won't you hop on over to the Peachy Keen Challenge Blog, and let us see what you can do with this fabulous sketch!! I hope you have as much fun with it as I did! Thanks for stopping by today! As always, its a pleasure to have you, and I hope you can come back often. May our good and gracious Lord bless and keep you on this day and always! Happy Stamping, and have a glorious day, my friends!! Another beautiful card, Lorie! Love your coloring, as always!!! Colors are great too, and your attention to detail rocks! LOVE IT!!!!! Such a super card! I love the detail...and the fish net...I need your pattern...that added just the right detail! I have yet to color up Lulee, you have now inspired me to get to it! The colors on this card really pop! I love it. Those Peachy Keen stamps are too too cute. Love them! What an awesome card!! I love this image, she is just so cute, and your coloring is fab. so so SO stinkin' cute! I love it!! Love you Ma! Lorie!! This is INCREDIBLE!! Omygoodness, I Love your colors and that lil flower swim cap of hers is tooo toooo cute!! Fab papers and embies. Love how you did the sentiment too. You are a master...and I'll have to use your words and say this certainly is a feast for the eyes as well. Big time! I love this cutie patootie and the sweetie pie artist! I am always in awe of your cards, Lorie, but this one especially shines! Your watercoloring is just so perfect -- you really brought this little one to life. The fishnet is such a great touch to tie it all together!! Oh, what fun this card is!! I love that little guy! This card just shouts "summer!" Very nice! Hi Lorie, I occasionally landed on your blog and like what I see here. You do wonderful artwork! And so I will make a visit again on your place from time to time to see what's new.